- Strictly 18+ events are available please click here for those. - Set in a 25,000 sqft 18th Century Courthouse just outside of Birmingham. Synopsis :- " In a post apocalyptic world where the virus has spread throughout the population, where the aquatic quarantine trenches are the only barriers between you and the aggressive virus, fear not! You are invited for your annual booster vaccine at this 18th Century Courthouse now a top Harvetech purification center, Harvertech being the bio tech firm that first found a cure for the virus known as the Progenitor virus. You'll be welcomed by our top Havertech physicians and made right at home for the duration of your stay..."
Voted "Best Zombie Experience" at the national ScareCon Awards 2018 comes a fast paced experience set across an amazing 18th Century Courthouse. The event mixes immersive theater, mind blowing action (a new Railgun system with optional laser upgrade), escape room puzzles and movie quality realism over an adrenaline fueled two hour zombie frenzy. Thing won't quite go to plan as you're thrown into a story that will have you fighting alongside a post apocalyptic rebel group (The Infection Rebels) as you try to save their colleagues, expose Harvertech and the unethical work they are carrying out and rid the world of the deadly infection. Bring your wit and intelligence as you’ll tackle elements that require more than just fire power! 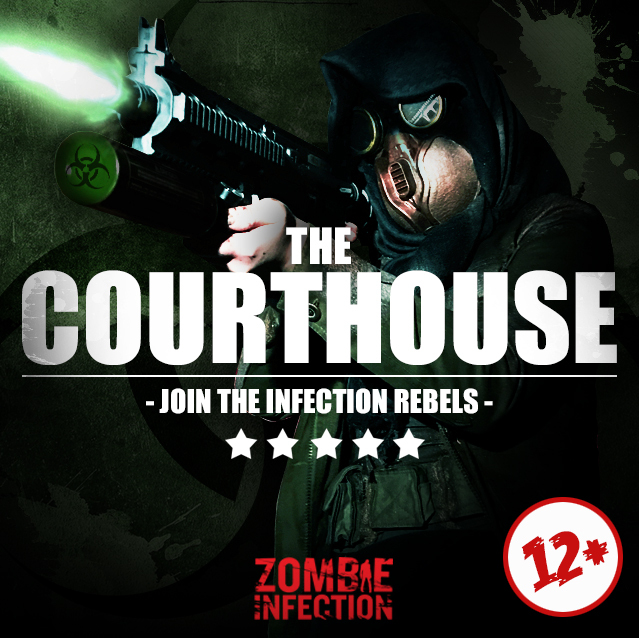 With several escape room type puzzles you’ll need to work quickly and as a team to unlock the doors to the courtrooms and explore the environment! But don’t worry, we wouldn't throw you into the apocalyptic courthouse without some help! Grab the latest weaponry, upgrade it and keep your guard up as you take on not only the recently infected but the infected Harvertech guards working to secure the facility as you make your way through this brilliantly crafted action packed experience. If you manage to survive you’ll get to meet the cast and crew, take photos and discuss survival techniques with your fellow team mates! This event is an exclusive experience and will have limited dates available. Please note this is 12+ only, late arrivals or guest arriving intoxicated may be refused entry. 12+ guest must be accompanied by at least 1 adult 18+.